The documentary Blackfish explores how the captivity industry has perpetuated long-held misconceptions and harmful living conditions for the stars of the show, orca. The welfare issues have apparently caused the whales to lash out violently toward their trainers. Attacks, including deaths are researched, leading to some uncomfortable questions that are helping to change the way the public views places such as SeaWorld. When filming was underway in 2011-2012 for the paradigm-shifting documentary Blackfish, the Free Morgan Foundation (FMF) was involved at many levels, because of our expertise and because of Morgan herself. The original concept of the documentary was proposed to have two threads; (1) the story of the adult male orca Tilikum, who featured in the released version of the documentary and is currently held at SeaWorld. And (2) the story of the young female orca Morgan, who was captured by the Dutch and then shipped to a privately-owned (German) theme park called Loro Parque, located in Spain. Morgan’s ownership is claimed by the USA based SeaWorld Entertainment Inc.
Director Gabriela Cowperthwaite and crew, during FMF board member interview, The Netherlands, September 2011. Photo FMF. Morgan, captured in Dutch waters on 23 June 2010, had a tragic story that needed to be told too. 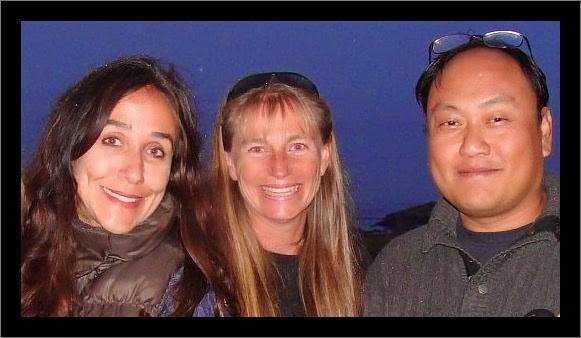 In 2011 the FMF Board of Directors was interviewed by director Gabriela Cowperthwaite and producer Manny Oteyza in the Netherlands, discussing the issues surrounding Morgan’s capture and non-release by the Dolfinarium Harderwijk. During this period a visit by Dr Ingrid Visser to see Morgan at Dolfinarium Harderwijk, as well as footage of the FMF team scouting out the potential location site for her rehabilitation in the Netherlands, were all filmed. Additionally, Dr Visser accompanied the film crew when they went to Spain and into Loro Parque to interview staff there (they were denied the interview) and when they filmed interviews with Alexis Martinez’s fiance and mother. Alexis Martinez was tragically killed on 24 December 2009 by Keto, SeaWorlds‘ adult male orca. This is the same male orca who still resides at Loro Parque and who is typically kept with Morgan in an attempt to breed her. The Orca Research Trust (ORT) was also associated with the documentary – as all the wild underwater footage of orca was filmed from the ORT boat, in New Zealand waters. As Morgan’s story developed the saga became extremely complicated. Additionally, Tilikum’s story also began to be revealed and the complexity of his situation was exposed. Unfortunately, as both of these captive orca had such compelling stories to be told, it became apparent that wasn’t feasible to include Morgan’s plight in the final version of Blackfish. However, it is hoped that all the Morgan-relevant footage captured as part of the original concept of Blackfish, but now held in archives, can be revived and used for a documentary featuring Morgan. 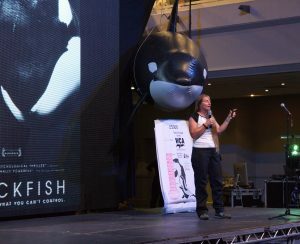 The original release of the documentary Blackfish was through independent film festivals, such as the prestigious ‘Sundance’ festival, where it premiered on 13 January 2013. 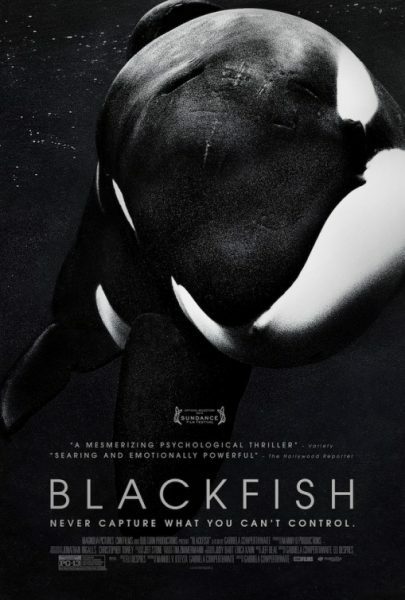 Within days of its first screening, CCN purchased the documentary in order to air it on TV and since then Blackfish has apparently been viewed by more than 60 million viewers and is one of CCN’s highest ranked documentaries. On 31 August 2016, the World Economic Forum listed Blackfish as one of the ‘10 movies that changed the world‘. The World Economic Forum is comprised 1,000 of the world’s top corporations and global enterprises with more than US$5 billion in turnover. They stated “A good film does more than entertain or fill seats at the cinema. It has the power to change hearts and minds – and sometimes society more widely.” That is exactly what Blackfish is. Acknowledging the importance of Blackfish, the FMF has hosted or attended a number of screenings of Blackfish, around the globe, including in Antarctica. Audiences have varied from school groups to law students, community groups to organised venue events in local theaters as well as at a group of whale-centric people at WhaleFest. Typically audience numbers have ranged from 30 up to a few hundred. 17 January 2014. Screening of the documentary Blackfish in Auckland, New Zealand. Followed by a Q&A session with Dr Ingrid Visser. Screened in association with the Orca Research Trust and the distribution firm Madman Entertainment. 15 March 2014. A special ‘Directors Cut’ screening of the documentary Blackfish in Brighton, UK. Part of the WhaleFest 2014 event. The ‘Directors Cut’ was a screening of sections of the documentary that were pertinent to each of four guests; Sam Berg (ex-SeaWorld trainer who appeared in Blackfish), Dr Naomi Rose (orca researcher who has been fighting cetacean captivity for more than 2 decades), OBE Will Travis (CEO of the Born Free Foundation) and Dr Ingrid Visser (FMF Board Member). Each guest had pre-selected a section of the documentary and discussed the relevance of it to their own outreach and work. 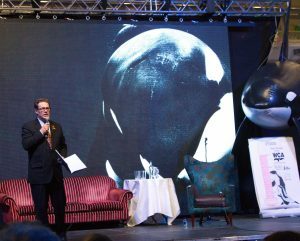 Dr Visser chose a section showing Loro Parque and spoke about Morgan and her plight and the links between Morgan and Blackfish. 4 November 2015. Screening of the documentary Blackfish in Klein-Winternheim, Germany. Followed by a Q&A session including FMF board member Rosina Lisker. 22 October 2015. Miami, USA. University of Miami Law School. Dr Ingrid Visser attended a Q&A session via video conference, after the screening. Also on the panel were Samantha Berg (ex SeaWorld trainer, Voice of the Orcas) and Dr Naomi Rose (Animal Welfare Institute). January 2016. Scott Base, Antarctica. Postgraduate Certificate in Antarctic Studies, adult student group with the University of Canterbury and Gateway Antarctica. Students attended a screening of Blackfish and a Q&A session held by Dr Ingrid Visser. 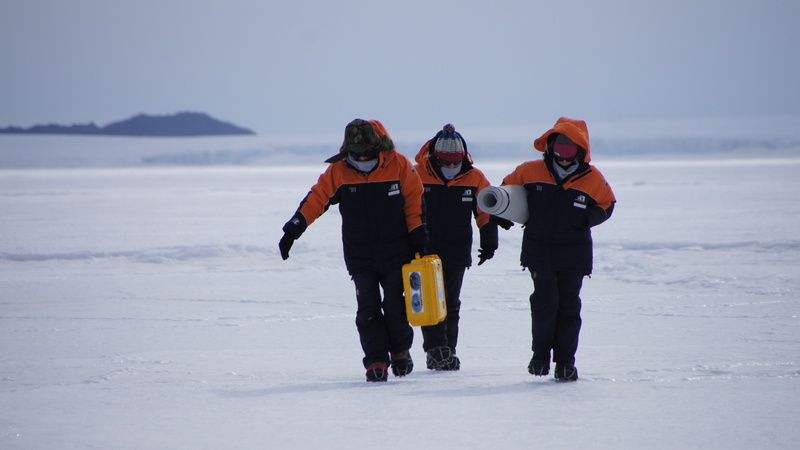 This was followed by field work using hydrophones and recording equipment out on the ice shelf near Turtle Rock.